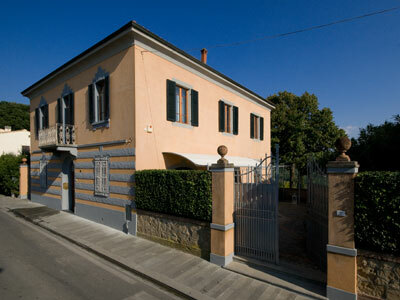 Villa Angelica is an elegant villa in Art Nouveau style that dates back to the mid-1800. It was skillfully renovated 10 years ago, keeping its architectural characteristics unchanged. It is furnished in very good taste in all its details, with original furniture from the 1800s, which gives the villa a special elegance, and it is enriched by valuable decoration, paintings and original ceilings which take us back in the time, letting us savouring those places. On top of a hill at 150mt. above sea level, overlooking a magnificent scenery rich of vineyards, olive groves and singular hills that surround the town of Volterra, the small medieval village of Fabbrica was built in the age of the medieval noble families of the Grand Duchy of Tuscany. Today, the passing of the years has not changed the village so the place is still typical and authentic as places and people throughout our Tuscany are. The village grew into an upper part called “La Torre”, where the stronghold was and another part, more gentle and less steep, where the houses of the village rose, among which we find Villa Angelica. Within a short distance you will find everything you could need: tennis courts 7 km, golf courses 12 km, horse riding 4 km, restaurants from 2 km to 7 km, shops 100 mt ,spa 15 km, prehistoric park 7 km, astronomical observatory 4 km, pharmacy 100 mt, bank 150 mt, post office 100 mt, Carabinieri’s station (police) 7 km, church 1 km. The nearest town is Montelopio, just 1.5 km away, where you can find shops, pharmacy, bank and post office. In Peccioli, just 7 km away, there is a supermarket and interesting shops.